A new poll of people living in the Bristol Bay region has found broad concern and opposition to the controversial Pebble Mine project. More than 75 percent of people surveyed in a recent poll said they were either strongly opposed (70 percent) or somewhat opposed (5 percent) to the mine project while only 12.5 percent of respondents said they supported it. A total of 80 percent of people said they were concerned the mine would pose a risk to commercial, sport and subsistence fishing. The poll was conducted by the Hays Research Group for the United Tribes of Bristol Bay, a consortium of tribes that’s opposed to hard-rock mines in the region, between June 6 and June 15. The survey contacted 400 Bristol Bay region residents and the survey has a self-reported margin of error of +/- 4.7 percent. Alongside the opposition to the mine project, the survey also found general distrust of the permitting process and the plans for the project’s future. Only 29.5 percent said they trust the Army Corps to “protect the watershed, the fish and the economy in Bristol Bay” (55 percent said they didn’t trust and 15.5 percent said they didn’t know). The Environmental Protection Agency didn’t rank particularly well with respondents, either, with just 36 percent saying they trusted the agency to protect the region, while 58.5 percent said they didn’t and 5.5 percent said they weren’t sure. The state’s permitting process fared better with 46 percent saying they felt it’d protect the watershed (40.8 percent opposed and 13.3 percent didn’t know). U.S. Sen. Lisa Murkowski was also polled on her trustworthiness to “protect the watershed, the fish and the economy in Bristol Bay.” Murkowksi is trusted to do so by 42.8 percent of residents, according to the survey, while 32.8 percent said they didn’t trust her and 19.5 percent said they didn’t know. The Pebble Mine project found new life under the Trump administration, but more recently has run into trouble after a key partner pulled out, the Environmental Protection Agency cooled on it and the governor is calling for an outright halt to the permitting process. That hasn’t stopped the mine in its tracks and it’s continuing to push along under the U.S. Army Corps of Engineers’ permitting process, though the size and scope of the mine has been significantly reduced from the initial proposal. The mine is the focal point of a voter initiative that would ramp up the state’s involvement in permitting any projects that could affect fish habitat. 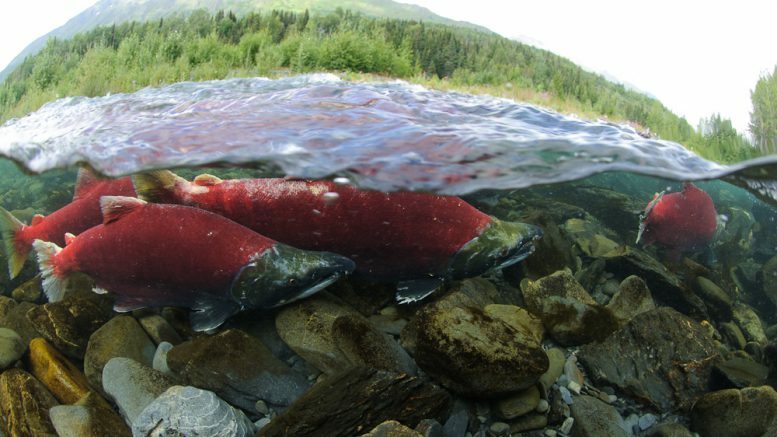 The Stand for Salmon initiative, if approved, is expected to make state permitting for Pebble Mine more rigorous and difficult. Opposition to the initiative has already drawn significant political spending by the resource development industry. 1 Comment on "Poll: Most Bristol Bay region residents oppose Pebble Mine, doubt permitting process"
80 percent of the Alaskan resident dipnetters standing on the Kenai beaches oppose the threat of commercial fisheries taking fish out of their freezers, and distrust the board of fisheries process that favors sending food overseas in commercial fisheries than sending it home to feed Alaskan families. That sentiment doesn’t seem to faze the Governor, the ADFG Commissioner or the rationing process called the Board of Fisheries that traditionally is packed with commercial fisheries aligned interests.